Blog / Recipe Roundups / 101 Spring Freezer Meals to Keep Your Life Sane! Spring is in the air! Keep sane as the busy season picks up with 101 spring freezer meals. The birds are starting to sing, the flowers are starting to bloom, and fresh produce is on the rise as the weather warms. You definitely want to have spring freezer meals ready to go so that you can enjoy the sun! With baseball practice, track meets, impromptu grill outs, you need to keep life sane and your family fed. You can also use this list to create your own custom, seasonal menu using your Membership. Get started with one of these menus we have created from the list. 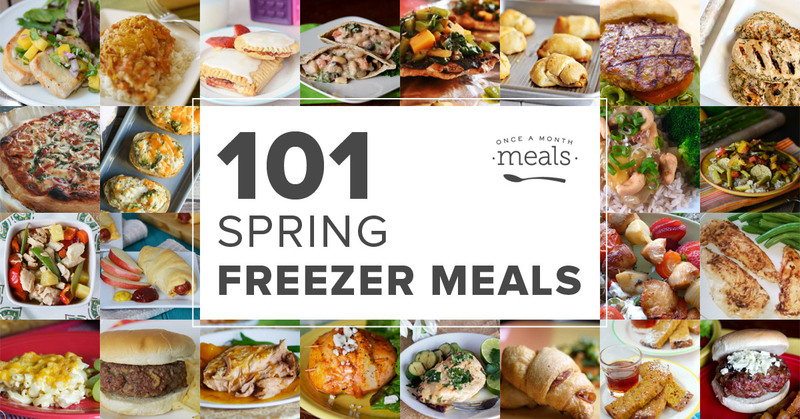 For you visual types, check out our Pinterest boards full of Spring Freezer Meals. If you happened to stumble onto this post during the wrong season, you can browse our 101 Summer, 101 Fall, and 101 Winter Freezer Meals posts for seasonal ideas throughout the year. Recipes marked with ** are easy to assemble or require minimal cooking to prepare. Thanks so much for the list. I found quite a handful of recipes that I know my kids would love! Thanks again. Great post. Thank you for this!! Pinned it! Love it! Thank you so much for the great post. I can always count on your site for great ideas. Thanks again! Wow! This is an amazing list!!! I just wrote a post on setting up a six-week meal rotation and as I was looking at it, I was thinking I need to change up some meals for the Spring. This is just what I needed. Thanks! You are most welcome! So glad it helped with your meal planning. That is our hope! Love the latest list…thank you! If you’re open to website suggestions, it’d be great to have a search function to help weed out different allergens (we are dairy free). But thank you for the list, meal ideas and especially freezer directions! That is fantastic, Tricia! Thank you! Oh my!!! Thank you thank you!! May is my freezer meal bootcamp!! I can/WILL do this. I have been adding more and more of your awesome menus since January! Thanks! So glad to help! Wow, you are amazing! I’d pay somebody to set this up for me!! I found your site on Pinterest and LOVE the meals I’ve tried so far. Great for our busy family. Do you freeze the Frog Eye Salad? I have in past and it’s worked! I’m a new mom and still trying to get my family orginazed and this will help so much. THANK YOU! i’m making my husband buy a new freezer this weekend. Great idea on the freezer, and I am glad this post is helpful. #5 freezer meal says not recommended for freezing in the recipe instructions. You are right! We’ll look into finding a right substitute!